This comfortable 3-bedroom, 2-bath home is located in Willow Cove, and comes with a Boat Slip at Bass Lake. This modern home combines the woodsy look of a classic lodge with current conveniences. The grand room has a two-story ceiling, two couches, an armchair, and large fireplace. 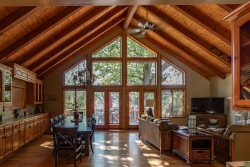 There is a beautiful forest view from both the living room and the large deck, which is a wonderful place for you to relax with a cool drink, serve a meal, or use as a play area. The dining table seats 6, as do the stools at the kitchen and bar counters. The large master bedroom has a king-size bed. The second bedroom has a queen, and the third provides a full-size bed, a single bunk, and a trundle bed. There are 2 full bathrooms, laundry, WiFi, and cable TV. The home is on a large level lot, with easy parking for a maximum of 3 vehicles.